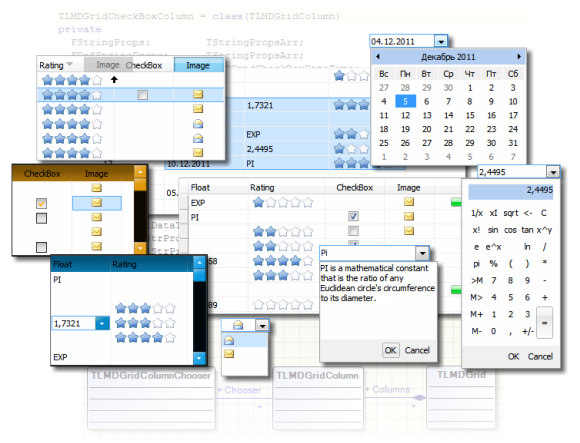 LMD GridPack is is a set of components which allows to organize/display application data in a grid-like format using various types of built-in grid columns. Grid data is Variant based, with Null values support. End user can select and edit data, sort rows, reorder and resize columns. Since LMD platform release 2014 support of VCL Styles (available in Delphi/C++ Builder from XE2 on) is available. Purchasing LMD GridPack includes the LMD CorePackage (adding almost 100 additional core controls like editors, containers etc.). Custom chooser, which is an event based control which can be used to implement arbitrary any type of custom chooser; Use OnChooserShow chooser's event to show and handle your own custom dropdown control.